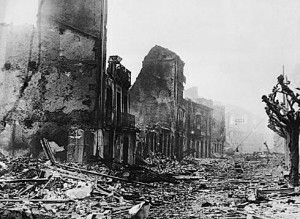 The town of Guernica after the April 26, 1937 bombing. Calling for a no-fly zone over Libya, Australian Foreign Minister Kevin Rudd said in a speech to the Human Rights Council in Geneva that “we should never forget Guernica,” The Australian reports. “Guernica is known throughout the world for the bombing of the civilian population. We have seen evidence of that in Libya. Let us not simply stand idly by while similar atrocities are committed again,” Rudd told the AP. I wounder if I might use your picture of Guernica in a school project? Oh Dear! What about Dresden? @Anna: The Fair Use policy means that you can use copywrited material in a school project without getting permission first.